Our range of products include polyamide (pa.6) mos2 carbon black, polyamide 12, polyamide 66, polyamide cast (nylon-6) (pa 6g) and polyamide (pa.12) mos2. In comparison to unfilled PA 6 improved sliding properties at slightly higher compressive strength. UV-radiation resistance is enhanced by its black color. It has also improved wear resistance and lower surface friction than unfilled PA 6, moisture absorption is also bit lower. PA 12 has very good impact resistance, it is tough and, because of its very low water absorption, it remains dimensionally stable. As a semi-finished product it has only a limited availability, but because of its high price (3 – 4 times more expensive than PA 6) it is usually not considered in design options. PA 66 is used in smaller dimensioned applications and offers higher rigidity and wear resistance compared to PA 6. PA 66 shows comparable continuous high working temperature range. Compared to the cast varieties, this material also has higher water absorption. Regarding the other properties, PA 66 is comparable to the standard cast type PA 6 G, however it is much more costly. As in the case of PA 6, the manufacturing process limits the size and unit weight which can be produced, and this restricts the design possibilities of the user. Therefore PA 66 in practical application is replaced to a large extent by the more economical PA 6 G, which can also be produced in almost unlimited sizes. Polyamides manufactured in monomer casting (PA-6G) show a higher degree of crystallinity and thus have much better material properties than the extruded nylon types. But apart from the type specific properties, all polyamides share, independently of their manufacturing process, a great number of basic properties specific to the material. 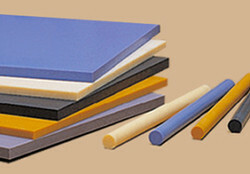 PA 12 with MoS2 has exceptionally high wear resistance. Applications are for high end use for maintenance-free parts or parts subject to impact or environments in which noise and vibration damping properties are required. Preferred for sealing and damping elements; valves, pumps and fuel line applications.